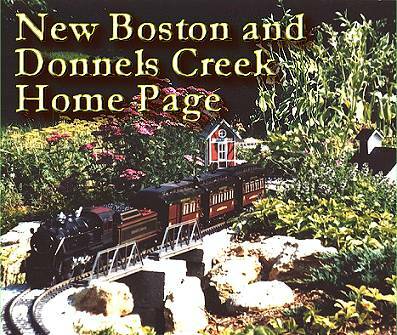 The New Boston and Donnels Creek Railroad was built and is maintained by Paul Race, editor and principal author for the "Family Garden Trains" site, an online reference for garden railroaders and people who are thinking about being garden railroaders. Note: I have put this site up to encourage other "ordinary" folks to take the plunge into Garden Railroading. I'm no carpenter, but I know how to move rocks and follow simple instructions. Basically, if I can do it, you can do it. If you spend some time on the site, you'll realize that I started with a very bare garden and a loop of track around a store-bought pond, and just kept adding plants and ideas until I got something fun to watch and operate in the back yard. The first iteration was a loop of track on a bed of mulch in the side yard in the spring of 1998. But ground wasn't actually was broken until the summer of 1998, after the loss of two large trees opened up a space in the yard we didn't even "know we had." I started with the pond, since I figured that it would be easier to build a railroad over a pond, than a pond under a railroad. The track wasn't really laid until it was too cold to play with the trains much. Extensions and additions grew slowly, as did groundcovers at first. Now visitors seem impressed with my "green thumb," but in 1999, it looked like I was modeling the Mohave Desert. Along the way, I've made many mistakes that you won't have to make, and learned some relatively simple approaches that will make your life simpler and save you money besides. So take a tour of the past, present, and maybe future of my railroad. And when you tire of me talking about my well-planned projects that failed and my accidents that succeded, you can go back to the Family Garden Trains site to see information of a less personal nature. Stress Testing on the NB&DC RR - records a June, 2000 open house in which we let about 10 6-11-year-olds run the trains all afternoon during my first daughter's graduation open house. Preparations for our first Christmas Open House, 2008 - These were actually posted to our "Blog-Like-Articles" page, since I was keeping readers updated on an ongoing basis. However, I've copied the links here to contribute to the chronological record of our efforts. Fall Has Fell (2009) - and my Christmas Trains are Grateful. - Long-range planning for our Christmas-themed open house in 2009, also from our Blog-Like Article section. 2009 Christmas-Themed Open House on the NB&DC RailRoad - The Race family's second Christmas-themed open house included more lights, more trains, more music, and better snacks. Even if you didn't get there, we think you'll enjoy the report, the many ideas, and the many photographs. April, 2010: Landscaping Rehab and Idiot Tools - A "grocery list" of things I did to fix or update garden and landscaping problems that affected our railroad's appearance, functionality, and even safety. It may give you some ideas. It also serves as a reminder to do things right the first time. New December, 2010: Third Christmas-Themed Open Railroad - From our New Boston and Donnels Creek railroad, a report on our third Christmas-Themed open railroad. We were too busy this year to make many additions to our open railroad, but we did make every effort to help folks have a very good time. And over a hundred did, including many well-behaved children, some of whose families are starting to make this an annual event. Click on the photo to read more. New December, 2011: Fourth Christmas-Themed Open Railroad - We added more children's trains, more snacks, and more lights. Unfortunately a scheduling mixup kept some people away, but those who came had a great time, especially the kids, who loved the trains they could run. Christmas Train Day Report: Our Fifth Christmas-Themed Open Railroad - For several years, we've been announcing these events by telling our "non-railroading" friends that we were having a Garden Railroad Open Railroad. Then we had to explain what a Garden Railroad is. Then we had to explain what an "open railroad" is. This year we gave the event a name: "Christmas Train Day." People still couldn't picture what it was all about until they got there, but at least they figured out it had something to do with Christmas and with trains. Under the new name, our fifth Christmas-themed open railroad was held on November 10, 2012. 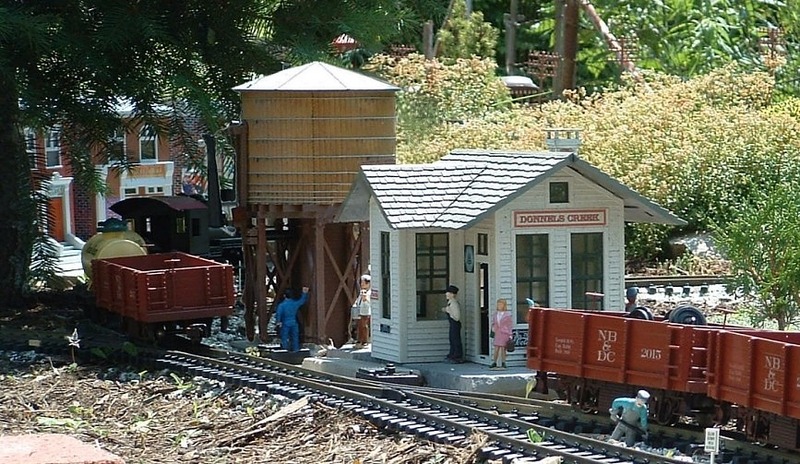 Our garden railroad, the New Boston and Donnels Creek was open to the public, in conjunction with the NMRA show in Dayton a week earlier. We had several trains running, including three trains the kids could run, lots of Christmas lights, Christmas music, outdoor movies, popcorn-machine popcorn and other treats, and lots and lots of helpers and visitors. A good time was had by all. Click on the picture to go to the article. Preparing for a Once-in-a-Decade Open Railroad. 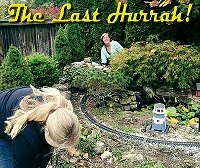 - This April, 2013 blog-like article shows some of the things did to start getting ready for our open railroads in conjunction with June's National Garden Railway Convention. Since some of the maintenance is going to make permanent changes to the railroad, the followup articles will be indexed from this page. To go to the article, please click on the picture to the right. Prepping for the 2013 Open Railroads Part 1 - (May, 2013) While we do the work and rework necessary to prepare for our open railroads this year, I'm keeping a sort of photo journal of everything we do. Ironically, some of the photos we've taken recently will be working their way back into articles about the original projects we did years ago, because they illustrate what we should have done in the first place. But many of the photos just apply to rework - so those are going into this article and its sequels, hopefully as an inspiration to anyone else who has got seriously "behind the curve" with their garden railroad maintenance. Prepping for the 2013 Open Railroads Part 2 - (June, 2013) Once we got most of our buildings are mostly under control, we started work outside, mostly weeding. Weed grasses have made a dent in some of our nice groundcover patches, raccoons have dropped boulders on the track, and Mother Nature in general has disposed of most of our ballast. Hopefully our repairs will be more fun to read about than they were to do, but you may also find ideas or encouragement. Prepping for the 2013 Open Railroads Part 3 (June, 2013) Check out the last "chapter of a photo-journal on the work we did for our convention-related open railroads. Work included repairing track connections, reballasting, mulching, building arrangement, testing rolling stock, etc. - stuff that took us right up to the last minute before the first visitors arrived. June, 2013 Open Railroads - (June, 2013) In 2002, we hosted an open railroad in conjunction with the National Garden Railway Convention and had maybe 20 visitors. This year we had almost that many before the sign went up. Lots of visitors, lots of questions, lots of chances to encourage "newbies"! Thanks to all who attended. For an account of a fun and crazy day, click on the picture. November, 2013 Christmas Train Day - (November, 2013) This year, the Dayton NMRA chapter train show wound up NOT sponsoring open RR tours (the reason we started having open RRs in November in the first place). But our little friends would have been heart-broken, if we hadn't gone ahead. So we did it anyway. The buildings were still in place, but there was other prep, as always. Fun was had by all. Click the photo to see more. Prepping for an Early Winter Open RR - One good thing about open railroads is that they make you finish up a lot of stuff in a hurry. The bad thing about doing it in November is that you might have Mother Nature to contend with. Seriously. Temporary RRs staked out, lights on the trees, thyme cut back from the ROW. We're making progress. We'd make more if it wasn't for the leaves and the snow. Christmas Train Day, 2014 - Report - We our seventh annual Christmas-themed open railroad on our own New Boston and Donnels Creek on November 23 this year. As always, there were many preparations. This year, we added another kids' railroad and attempted to make the kids' railroads we already have more reliable so the kids would be less frustrated. As it turned out, it's a good thing we did, since we got many more kids than adults this time, and the kids all had a blast. Click on the photo to see our report, with lots of photos and tips. Preparing for Christmas Train Day, 2015 - Right after our 2014 Christmas Train Day, came a huge snowfall that kept us from bringing our buildings and even many of our figures in for most of the winter. I wound up leaving some of the buildings out all summer, but the big cleanup started when we were preparing for the next big thing - Christmas Train Day 2015. Click on the photo for details. Christmas Train Day, 2015 - Report - As it turned out, this was our last "Christmas Train Day" on the original New Boston and Donnels Creek. I did a lot of work prepping the buildings, etc., and we had a great time once it was happening. But after it was over, I took the buildings inside, in case of another early snow - like the snow that fell right after our Christmas Train Day in 2014 and didn't melt off until March, 2015. We didn't realize at the time that this was an "end of an era," but we are glad that we took lots of photos and saved some great memories for our readers to share indefinitely. Click on the photo to see the report. The Last Hurrah! - In 2016 we moved, in what turned out to be a very long process. I took all my trains and related paraphernalia(still in boxes) to the new place, but at our realtor's suggestion, I left my track and more realistic bird feeders on the ground during the showings, in case we'd find someone interested in owning a house with a garden railroad. We did, eventually. So the track that was on the ground went with the house. So did the bird feeders, but they weren't going to cost nearly as much to replace. There was also a wedding in the family, and the bride (our oldest daughter) wanted to have the rehearsal dinner at our "old" house, with the trains running "for old time's sake." So I brought a bunch of buildings and figures and several trains back from the new house and my youngest two helped me get things ready for company. One more run, not advertised, not many children, but lots of fun for all who were there. Families who remembered our "Christmas Train Days" from the past asked us if we were going to have one in 2016, but there was just too much other stuff going on. In the meantime, to read about our "last hurrah" on the original New Boston and Donnels Creek, click on the photo to the right above. Planning the NEW New Boston and Donnels Creek, Part 1 - If you're subscribed to our newsletter, you know that we moved just after Thanksgiving in 2016, leaving behind most of the track, a few of the bird feeders, and one Bachmann train set for the new owners. We also left behind a high-maintenance garden that we do not intend to replicate at the new place. This is the first chapter of a new chapter in our lives, which we hope will include a lot of "lessons learned." But first, some serious landscaping had to take place. Click on the photo to see what we were considering in March, 2017. 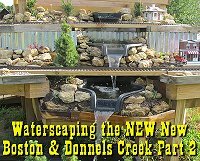 Planning the NEW New Boston and Donnels Creek, Part 2 - More plans. We've moved on from the 2"x6" roadbed-on-posts to a sort of "train-table-outside" plan. Our goals include low-maintenance, high interest, and high reliability. We're also trying to get around having a thousand dollars' worth of dirt hauled into the back yard. If you want to get some idea of what our planning process looks like, reading these through in sequence may help. Or it may drive you crazy. Click on the photo to see what we were considering in early April, 2017. 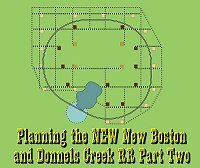 Planning the NEW New Boston and Donnels Creek, Part 3 - We have still not broken ground. In part because we plan to rent a post-hole digger and dig the post holes for our raised vegetable garden and the first phase of the garden railroad at the same time, and we don't have enough lumber on hand yet. (If we didn't break it down into multiple trips, we'd be blowing out the shocks on our minivan.) In the meantime, we used a line level to see if the slope of the back yard was as bad as we thought it was (it's worse), and we did other site preparation, including planting a whole bunch of spruce tree seedlings to eventually give us some privacy in our side and back yard. Plus, I'm still wavering a little on the "where-to-start-first" issue. Click on the photo to see what we were considering as of late April, 2017. Planning the NEW New Boston and Donnels Creek, Part 4 - Well, the rented post-hole digger fell through, so we dug our vegetable garden with a manual post-hole digger (the scissors kind). In addition, I stake out where the railroad was going to be. Twice. And tweaked the plans again. Sorry about the redo's, but sometimes just walking around the yard trying to visualize things makes me reconsider something that seemed "settled" only a few days before. Click on the photo to see what we were considering as of late May, 2017. Breaking Ground on the NEW New Boston and Donnels Creek - Okay, in case you wondered if we'd ever get started on the thing, we broke ground in July, using a manual post-hole digger. Well two manual post-hole diggers. But by the end of this article, we're ready for the posts to start going in. Click on the photo to see our status as of the end of July, 2017. 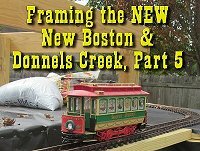 Framing the NEW New Boston and Donnels Creek RR, Part 1 - Once I started dropping posts in the holes and screwing things together, I didn't want to stop before I had the basic frame built (for one thing, the wood warps less once it's fastened in place). Now the folks driving down the street past our house (we're on a corner lot) probably wonder if I'm building an elaborate chicken coop, but that's fine with me. I still need to make a few more lumber runs and do a lot more cutting and sawing, but having the basic frame in place should make the next bits a lot easier. 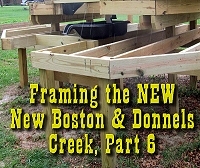 Framing the NEW New Boston and Donnels Creek RR, Part 2 - Once I started dropping posts in the holes and screwing things together, I didn't want to stop before I had the basic frame built (for one thing, the wood warps less once it's fastened in place). Now the folks driving down the street past our house (we're on a corner lot) probably wonder if I'm building an elaborate chicken coop, but that's fine with me. I still need to make a few more lumber runs and do a lot more cutting and sawing, but having the basic frame in place should make the next bits a lot easier. Framing the NEW New Boston and Donnels Creek RR, Part 3 - With the basic frame in place, I framed out the top layer and started ordering parts for the waterfall and planning the decking layer. It still looks like an elaborate play fort or something, but it's getting there. Framing the NEW New Boston and Donnels Creek RR, Part 4 - With the frame for the top layer finished, I added the 2"x6" decking, leaving some extra length where I thought I might need to make further adjustment. Then I set out a loop of track to test clearances and the placement of the bridge and waterfall weir. Framing the NEW New Boston and Donnels Creek RR, Part. 5 - Spreading the billboard-sourced vinyl underlayment on the top layer. Prepping used Aristo R2 track for (hopefully) many more years of service. Laying the first loop of track, attaching power wires with spade terminals, testing conductivity with a Bachmann streetcar, and more. Framing the NEW New Boston and Donnels Creek RR, Part 6 - Modifying and finishing the framing on the second layer, cantilevering, using R3 track versus all other pre-curved track formats, finalizing the track plan, why painting the track makes old and new track blend better, and more. This will be the last bit of "framing" in 2017, and it worked out well, considering. Decking the NEW New Boston & Donnels Creek. - Decking the 'middle layer' of our proposed three-tier outdoor railroad. Prepping more track, laying out track and decking to make certain we have measurements correct, installing most of the remaining decking for this layer. New Boston Goes On the Road - Well, the weather turned too cold too fast to get my railroad finished for my traditional mid-November Christmas-Themed open railroad. Which means all of my buildings were still in boxes when the Miami Valley Garden Railway Society set up a huge display at the Dayton Train Show and put out a call for more buildings. Click on the photo to see our town "out on the town" so to speak. Dirtscaping the NEW New Boston & Donnels Creek, Part 1 - Getting the existing layers ready to install gravel and dirt, including splitting and trimming fence boards to provide a little border around the edge of the layers, and beginning to dump the gravel. Also getting a few Taxus Hicksii very cheap to give me something green this winter, even if I have to move them later. 2018: Springing into Spring on the NEW New Boston & Donnels Creek RR. - Sorting out our priorities for the spring and summer of 2018. There a lot of little chores we really should get done before we start on the next big addition. Click to see our plans as of February 27, 2018. Adding Raised Roadbed to the NEW New Boston and Donnels Creek RR, Part 1 - Our test runs established that the gravel we poured around the track tended to work its way under the track and make things uneven. Since these layers wouldn't be easy to reach from every angle, I decided to add a 2x6 lumber roadbed under the track to make the right-of-way as bullet-proof as possible. Unfortunately, we got stopped by a bunch of bad weather about a third of the way through that relatively simple project. Still, if you wonder what it takes to cut 2"x"6" lumber for your railroad, there are some nice photos. Adding Raised Roadbed to the NEW New Boston and Donnels Creek, Part 2 - Trimming the corners off the roadbed on the upper layer and cutting the pieces that will support the curves on the middle layer. We need to get the upper two tiers of the pond installed before we totally complete this step, so the article doesn't show the finished product. You'll see it later as part of other articles. Dirtscaping the NEW New Boston and Donnels Creek RR, Part 2. - Adding barriers to keep the rocks, dirt, and plants where they're supposed to go, placing platforms and running wiring for buildings, adding rocks, dirt, and plants to the upper level of the railroad. 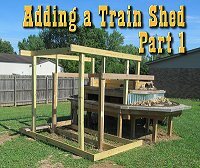 Adding a Train Shed Part 1 - What started out as a simple addition of a deck to stand on when putting trains on the track got a little more ambitious when I realized that JUST installing the deck this year would require more work next year. So we framed out what we planned to be a train shed attached to the railroad, so I can easily put trains on the track at a moment's notice instead of schlepping them out from the garage. Adding a Train Shed Part 2 - Adding rafters to the frame of the in-progress train shed. Now it's starting to look like it might actually be a structure and not just a crazy collection of posts. Adding a Train Shed Part 3 - Adding fascia, sheathing, and end trim to the in-progress train shed. Adding a Train Shed, Part 4 - Getting underlayment and drip edging on the roof. Now there's some protection from the rain, as long as it isn't coming sideways, as it tends do do this time of year. Adding a Train Shed Part 5 - Planning the doors, walls, and windows of our garden train shed. Includes installing the door, painting the windowframes, and adding crosspieces to support the vertical siding boards. Click on the photo to see our progress as of mid-October, 2018. 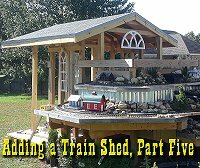 Adding a Train Shed Part 6 - Installing the board and batten siding on our train shed, installing the windows, installing the trim, testing the "tunnel entrances," and more. By the way, going over lumber receipts in early 2019, I couldn't believe I was still siding the train shed in late October, and managed to have an open railroad in mid-November. It is a little crazy how fast things can go together if you have a deadline and a lot of gift cards. Click on the photo to see our progress as of late October, 2018. Christmas Train Day, 2018 - After two years without our traditional Christmas Train Day (something we did from 2008 through 2015), we were anxious to get started again, even without a huge right of way to show off. The kids' trains, the extra Thomas railroad, the popcorn popper and two Bachmann Christmas trains got a big workout. And the visiting kids all loved it! Why don't we do it closer to Christmas? Because we sync it with the Dayton Train Show, whose NMRA participants used to have a tradition of open railroads the following weekend. Also, when we've tried to host it even a week later, we ran into much worse weather. So I tell people it's to "kick-start" their holiday season, and nobody really complains. Click on the photo to see a lot of last-minute preparations and some photos of the November 10, 2018 event itself. In the meantime, please poke around the site, enjoy yourself and imagine what you could do with a shovel and some rocks yourself if you had half a chance. And leave me a note if something gives you an idea. 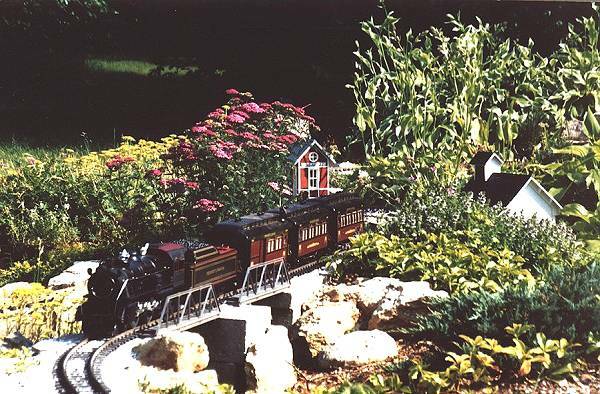 Also, if you're heading toward the Dayton/Springfield Ohio area, and you want to see a garden railroad that will make you feel better about your attempts, drop me a line. P.S. In case you wondered, the New Boston and Donnels Creek railroad is named after a pioneer village that used to be here and a creek that I used to wade in. The town of New Boston was built on the site of the "Battle of Piqua," a Revolutionary War battle in which George Rogers Clark attacked a Shawnee village on the assumption that they were British sympathizers. Ironically the same Shawnee village was the birthplace of Tecumseh, who a generation later did everything he could to pay back the "Americans" for the assault. The creek, in turn, was named after one of the founders of Donnelsville, Ohio, a tiny hamlet just west of Springfield on Route 40 and an early toll stop on the National Road. For a look at the area's history, click here. Note: Family Garden Trains?, Garden Train Store?, Big Christmas Trains?, BIG Indoor Trains?, and BIG Train Store? are trademarks of Breakthrough Communications (www.btcomm.com). All information, data, text, and illustrations on this web site are Copyright (c) 1999, 2000, 2001, 2002, 2003, 2004, 2005, 2006, 2007, 2008, 2009, 2010, 2011, 2012, 2013, 2014, 2015 by Paul D. Race. Reuse or republication without prior written permission is specifically forbidden.